In Vol. 4 of this series we look at a drill progression that teaches defending common offensive actions. By using three-on-three play, pressure man defense principles are applied to various situations. After implementing the basics of stance, stance angle, off-the-ball defense and help defense, it is important to begin learning to defend common offensive actions. There are endless varieties of offenses, but within those are common actions. Developing rules for defending these actions is key. Once those are mastered, unlock the common actions in an opponent’s offense and apply your principles towards stopping them. In a previous entry, the 3-on-3 on Top drill is used to combine the elements of stance angle, denying one pass away and jumping to the ball to deny basket cuts. The offense in the drill is restricted to pass, cut, fill action. Stopping the most simple play in basketball – the give-and-go – is a foundation. Making it difficult for wings to center the basketball is a tenet of pressure man defense and this drill emphasizes that and more. 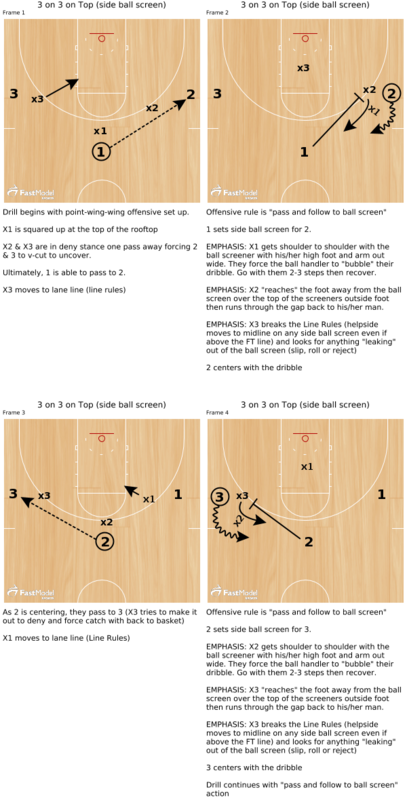 Advancing the drill to defending other common actions is done by giving the offensive players in the drill different directives. Let’s examines some other possible actions for the drill and apply our pressure man principles to each. A common offensive action at all levels of basketball is “pass and screen away.” A player at the top of the key passes to one wing and goes away to set a downscreen for the opposite wing. By using 3-on-3 on Top and directing the offensive players to pass and screen away players learn techniques to defend away screens and downscreens. There are a few different ways to defend this action but this approach best fits with our pressure man philosophy. Trailing or overplaying the cutter could result in a curl or back cut by the cutter. As discussed in the motion offense series, those are the preferred scoring cuts. By going ballside of the screen an outside cut (out or straight) is forced. They gives the defender an opportunity to defend on the perimeter and follow the number one mantra of pressure man defense: make your man dribble to his/her shot. Players must jump to the ball. When the ball moves, they move. The screener’s defender moves down the midline in deny stance in-line with the rim. They would be the help on a baseline drive. The cutter’s defender moves to lane line on the pass (Line Rules) and “shoots the gap” missing the screen on the ballside. The screener’s defender physically “pulls through” his/her teammate with their bottom arm as the top arm is in a deny position showing on the screen. Highly-reward and player or group that shoots the gap and knocks away the wing-to-point centering pass with the outside hand. There are a myriad of ways to defend ball screens. They are a factor of a coach’s personal style or a scouting report on a certain player or players. 3 on 3 on Top can be modified to fit trapping the ballscreen, ICEing or “downing” the ball screen, flat hedging the ball screen or hard hedging the ball screen. For the purposes of this #PressureManTips series the drill and points of emphasis will be on hard hedging. HEDGE: get hip-to-hip with the screener, widen the wide side of your body by extending outside arm and leg. Make the ball handler “bubble” their dribble, go with them 2-3 steps then recover. ON THE BALL: reach your away foot over the top foot of the screener and then run through the gap to recover to man and force back up the rooftop. 3 on 3 on Top can be modified or advanced to teach defending screen-the-screener action, flare screens, high ball screens and ball flashes. Get creative and think of ways this drill can be used to defend more actions!